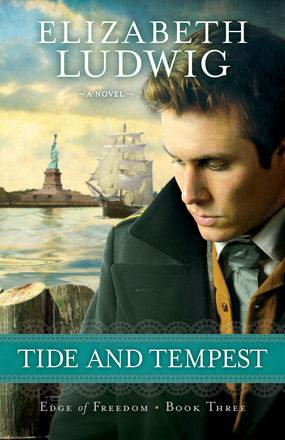 Bryan Note: I would like to welcome my wife, Tabitha, to JBG with her debut book review of Tide and Tempest. I love her review’s conclusion. Enjoy! Tide and Tempest, by Elizabeth Ludwig, is a story about Captain Keondric Morgan who has just docked his ship, the Caitriona Marie, in New York Harbor. His plan: reload supplies, make repairs to the ship and then be off delivering more cargo. However, a deathbed confession about a poisoned traveler, Braedon McKillop, has the good Captain worried about Braedon’s fiancé, Tillie McGrath, and the danger she may be in without her knowledge. Now Captain Morgan, his first mate, and brother Cass have to protect Tillie from harm and from each other’s love for her. Apparently this is the last book in the three-part Edge of Freedom series. Being the only book in the series that I have read, the author did a great job of allowing me to know some background of what has happened with the characters up until this point. The cast of characters in this book was extensive. I found the constant switching between a character’s last name and their “Christian name”, as the author put it, very confusing and hard to keep straight. The digital copy I received had numerous glitches (Kindle version). For example, several words had letters missing or the author’s name would appear randomly between paragraphs. This made the book both hard to read and comprehend. Overall, Tide and Tempest is a story of two acquaintances trying to figure out a mystery surrounding a ring and fall in love in the process. The typical Christian fiction book: a little mystery, a little scripture/prayers recited, and the boy always gets the girl…after he falls in love with her at first sight. Sigh. I was given a copy of this book by Bethany House. All opinions are my own. I was not required to write a positive review.